Nokia will adopt Microsoft’s Windows Phone as its primary smartphone strategy, the company said on Friday, after days of speculation on what it would do to compete with Apple’s iPhone and Google’s Android. Nokia President and CEO Stephen Elop, left, and Microsoft CEO Steve Ballmer, right, announce a new partnership between Microsoft and Nokia. Microsoft is already working with Nokia on the company’s first Windows phone, and the companies are in discussion with chip manufacturers, the companies said. However, they gave no indication of when the phone will go on sale. The companies will also partner on mobile ads—where Nokia will use Microsoft adCenter in mobile devices—and on mapping, where Nokia Maps will become part of Microsoft’s Bing search engine. Nokia’s application and content store will be integrated into Microsoft’s Marketplace. Before Friday’s announcement, Nokia CEO Stephen Elop had stated that Nokia needed to “decide how we either build, catalyze or join an ecosystem” to change its fortunes. In the end it decided to partner with Microsoft and join the Windows Phone 7 ecosystem. Nokia had approached Google about using its Android OS, but ultimately decided it didn’t want to play in a commodity market, Elop said. Adopting Android would also give Google too much of the services revenue associated with the phones, he said. In the competition between mobile phone manufacturers and OS vendors to make their platforms more attractive to developers and customers, Research In Motion isn’t even in the running, according to Elop. “This is now a three-horse race,” he said. 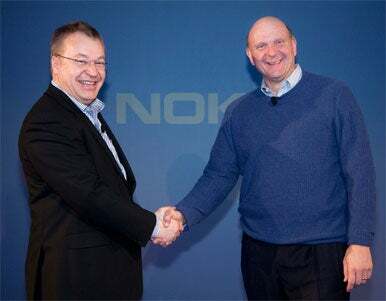 In its partnership with Microsoft, Nokia will contribute its hardware design and language support, and help bring Windows Phone to a larger range of price points, market segments and geographies, the companies said in an open letter from Elop and Microsoft CEO Steve Ballmer. Nokia won’t abandon its own platforms, Symbian and MeeGo, yet. The company still plans to put out a “MeeGo-related” product later this year, it said. However, Alberto Torres, who headed Nokia’s MeeGo push, stepped down from the management team on Thursday to pursue other interests outside the company, Nokia said. Nokia “expects to sell 150 million more Symbian devices in the years to come,” it said. In the fourth quarter it sold 28.3 million. With its new strategy, Nokia is hoping to put an end to a downward spiral that started in 2007, the year in which the first version of Apple’s iPhone arrived and Google announced Android. At the time, Nokia’s smartphone market share was almost 50 percent for the full year, compared to Apple’s 2.7 percent, according to Gartner. The first Android-based phone still hadn’t arrived. But by the fourth quarter of 2010, Nokia’s market share had dropped to 30.8 percent, Android had caught up and Apple had increased its market share to 16 percent. Friday’s change is an admission that its own platform has faltered, and by going with Windows Phone 7, the company is no longer in control of its own destiny, Wood said. But with Windows Phone 7, Nokia will have access to an operating system that can compete with Apple’s iPhone and Android — something the company hasn’t been able to produce itself, Pete Cunningham, principal analyst at Canalys, said in an interview earlier this week. Windows Phone 7 is far from a safe bet, however, as it, together with Microsoft’s older Windows Mobile OS, only managed to grab 3.4 percent of the smartphone market during the fourth quarter, according to Gartner. That Windows Phone hasn’t seen a spectacular take-up is partly due to the fact that it isn’t the priority for any vendor at the moment. Samsung, LG and HTC are all focused on Android ahead of Windows Phone 7. On Friday, Nokia also announced that as of April 1 it will have a new company structure. The Smart Devices unit will produce high-end smart phones running Windows Phone 7, and will also manage the company’s Symbian and Meego activities. The Mobile Phones unit will produce mass-market mobile phones, Nokia said.